Our discharge Hoses are designed for positive pressure fluid service and open ended drainage. Unlike a Suction hose, these hoses do not have a wire or spiral-helix reinforcement. 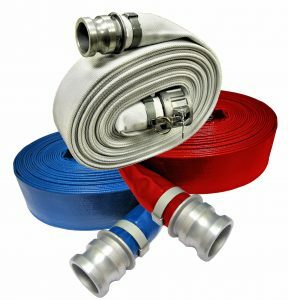 We offer a wide range of hose styles including Lay-flat PVC hose up to abrasion resistant gum lined rubber hose. Discharge hose products roll up flat in most styles for convenient storage and handling. Suction Hose products can also be used in many discharge applications where a non-collapsible hose is desired. The hoses depicted on these pages are not NSF approved and should not be used for drinking water.